For many years Bayfield has been known as a traveler’s destination. 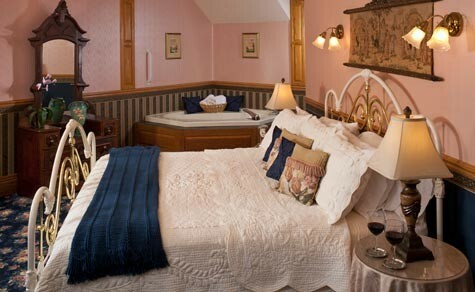 Whether you’re looking for a quick weekend getaway, or you’re sailing around the world, make your escape to our historic Bayfield, WI lodging, the Old Rittenhouse Inn. Travel on Hwy (35) North toward Duluth, MN. Take Hwy (2), East from Duluth toward Wisconsin and follow to Ashland. Just before Ashland, take Hwy (13) North about 21 miles, to Bayfield. Quick Route: Take U.S. Hwy (2) East approximately 70 miles to Ashland, Wisconsin. Turn Left (North) on Hwy (13) and take 21 miles. Scenic Route: Take U.S. Hwy (2) East through Superior, Wisconsin to Hwy (13) South. Take Hwy (13) South 60 miles to Bayfield. Take Hwy (51) North to Ironwood, Michigan. Turn Left (West) on Hwy (2) 51 miles to Ashland, Wisconsin. Turn Right (North) on Hwy 13 for 21 miles to Bayfield. Take Hwy (29) West to Wausau, WI. Head North on Hwy (51) to Ironwood, MI, then travel West on Hwy (2) toward Ashland, WI. In Ashland, go North on Hwy (13), about 21 miles to Bayfield. Take U.S. Hwy (94) North toward Madison, Wisconsin to Hwy (51) North. Continue North to Hwy (8), then turn Left (West) 40 miles to Hwy (13). Turn Right (North) on Hwy (13) toward Ashland, Wisconsin. Travel (West) on Hwy 2 until reaching Hwy 13 again, which heads North to Bayfield. Located 1 1/2 miles from the ferry dock on Big Bay Road. 3,000' paved and lit runway. Open year around. The St. Paul Downtown Airport (Holman Field), is located five minutes from the business center of St. Paul and 15 minutes from Minneapolis' core business district. The Best in Town. Bayfield's most luxurious place to stay.